This powerful ram was purchased in the 2009 Carlisle Blue Texel Society Sale for 1,500gns. This became the breed record at the time. He was purchased jointly between ourselves and Mr & Mrs G.A. & H.M. Francis, Pistyll Flock. He was purchased from D.G & M.H Jones, ‘Dulas’ Flock, Llangammarch Wells. The ram had initially caught our eyes in the Royal Welsh Agricultural Show in 2008, where he won the Blue Texel Breed Society Champion as a yearling ram. 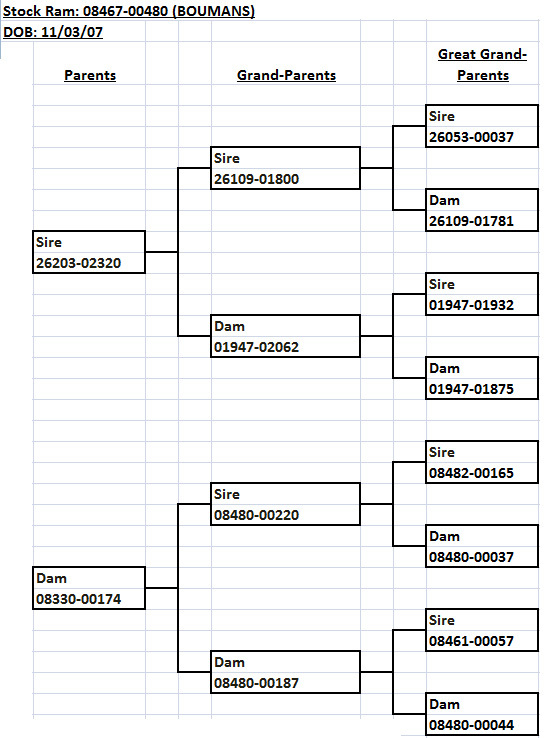 He went on to win the Breed Champion again at the same event in 2009 as a 2 year old ram. 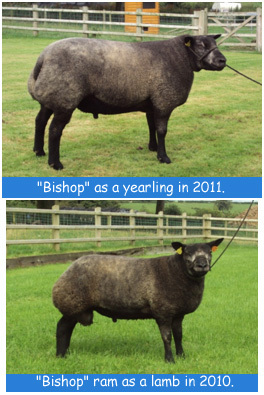 When we heard he was for sale at the Carlisle Society Sale, we knew he was what we needed for our flock to progress. 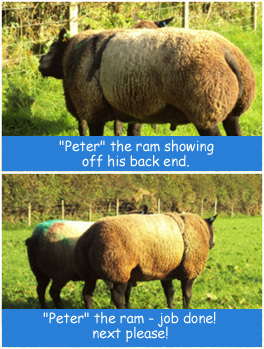 He is a very lengthy ram, has a tremendous back end and good tight skin. He has been a great asset to our flocks and has produced numerous excellent quality lambs over the past few years, lambs which have won first prizes at shows including the Royal Welsh Agricultural Show and have sold for top prices at Society Sales. This ram was bought as a lamb ram at Mr Andrew Bishop’s dispersal sale at Worcester in August 2010. We had no intention of buying anything when we went along to the sale, but this ram lamb caught my eye in the selection of ram lambs for sale on the day. His pedigree was of great interest to me as he was no relation at all to any of the ewes in my flock. 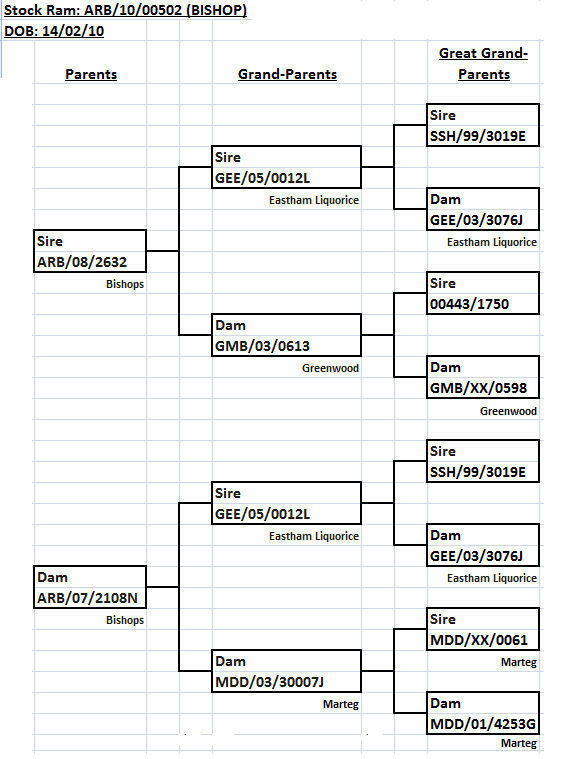 The advantage of going to a dispersal sale is that you can have a look at the family. His mother, a tremendous ewe, was sold for the top price of the day and half sisters, yearling ewes, also fetched very good prices. A twin sister of his topped the prices for the ewe lambs. 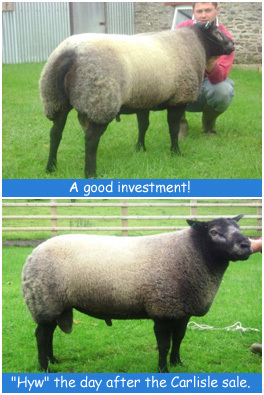 All his family were very good quality sheep and by purchasing this ram, we hoped that he would produce similar stock. He won third prize as a yearling ram in the class of aged rams at the Royal Welsh Agricultural Show 2011 and has continued to develop into a strong ram with an excellent back end and a very nice head which is not too strong and not too weak. All his lambs to date have very good carcasses and are nicely and correctly marked. We are very pleased with him. This was one of three rams purchased in the Netherlands following our visit in June 2011. This ram again is jointly owned by us and ‘Pistyll’ Flock. This is a magnificent ram, the best we saw during our visit to the Netherlands and luckily for us he was for sale, or “Te Koop” which is the dutch translation and one of the phrases we used most during our time in the Netherlands. The owner had around 25 ewes in his flock and most of them were related to this 2007 born ram, which is why they were willing to sell. He was part of a tremendous flock of sheep, all of which I would’ve been proud to have as part of my flock but unfortunately none were “Te Koop”! 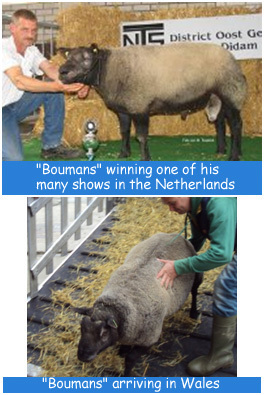 This ram is famous in the Netherlands as he has won numerous shows out there. The picture below is of him at one of these shows with his previous owner. This is one of the most muscular Blue Texel rams we have ever seen and we look forward to seeing his progeny. 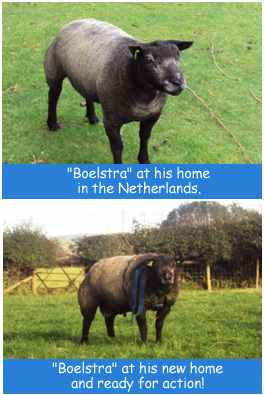 We purchased this ram from a flock in the far North of the Netherlands, one of the oldest flocks of Blue Texels in the country. You could see from his sheep that years of breeding meant that he had the cream of Blue Texels in this flock. He could not speak a word of English and we could not speak a word of Dutch so luckily enough we had an interpreter with us at this farm! He kept only around 20 ewes, all of which we liked but one in particular stood out, definitely one of the best and smartest breeding ewes we’ve seen. Unfortunately, she was not for sale – at any price! She was the star of his flock. We then went on to see his rams and a particular yearling caught our eyes. He was for sale and as luck would have it, who was the mother, but the star of the flock. This was a done deal. He was a proven ram as he had been used as a ram lamb and we were also able to see his lambs, all of which pleased us. We left the farm having purchased this yearling ram, jointly with ‘Pistyll’ Flock, and also 2 ewes for our ‘Beili Blues’ flock. He continues to develop day by day and is a very good powerful ram. Purchasing this ram was a bit risky! We did not have time to visit this flock whilst out in the Netherlands so we purchased him when we came home after seeing his pictures. 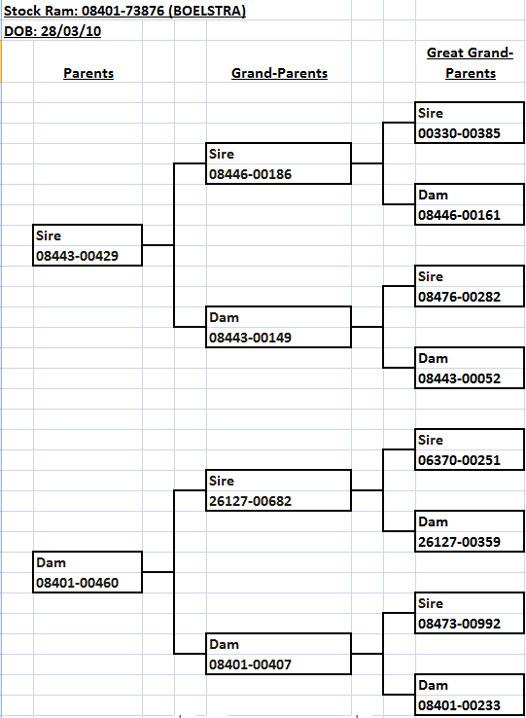 We’d heard of his good reputation from other breeders in the Netherlands and we knew he had top scoring statistics in every area. 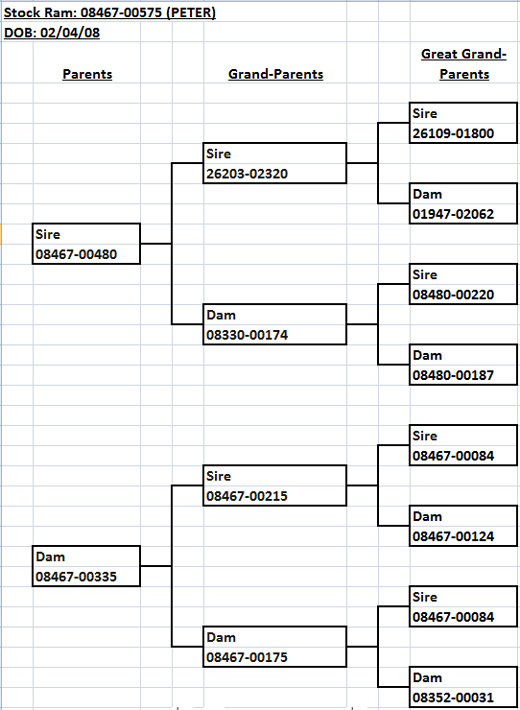 Every registered Blue Texel in the Netherlands is scored in a variety of areas e.g. development, muscularity, type, proportion, length, colour, markings, legs, wool, shoulder height. 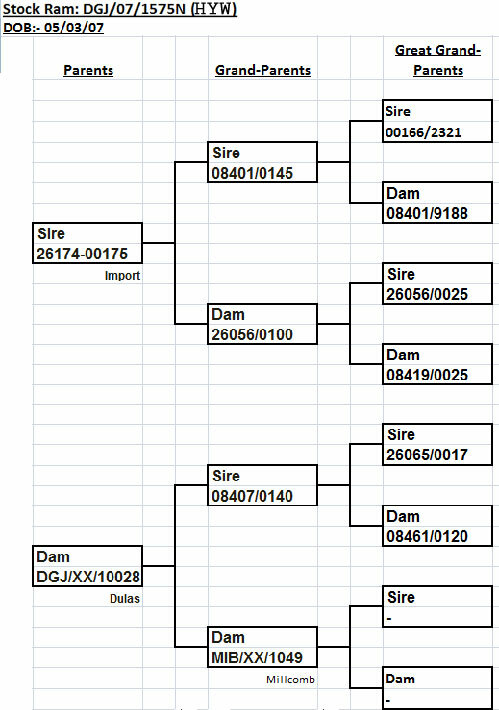 These statistics are very important to the Dutch breeders and it is something every breeder looks at when purchasing new stock. It may be something interesting for us to start looking at in the UK also. We were a bit nervous about seeing him before he arrived but as soon as he walked off the lorry, our fears were forgotten. Another satisfying addition to the ‘Beili Blues’ and ‘Pistyll’ Blue Texel Flocks. He is a very lengthy ram with tremendous body, muscularity and size.